He began flying with his father but the stars seemed a long way away. From the army to flying jet planes, he took his life a step at a time and included a happy marriage. Chris Hadfield’s basic methodology was to plan ahead, imagine the worse and calculate how to best to deal with it. Of course for him the worst was dying in space and to plan for that eventuality meant figuring out who would tell his family, who would help them get through the paper work at the space centre and other similar details. The problem here is that Chris comes across as being perfect, with no human weaknesses except a wholesome love for wife and family. What would happen if you weren’t top of the class and had health problems? Of course you realise why he is so philosophical when you discover that he spent twenty years preparing for six months in space. Most of his time was employed in preparing for what might happen and covering all the possibilities. And he certainly has his share of unexpected occurrences, like the droplets of water floating in his helmet that cause his eyes to sting. Not all of it was a cakewalk and given the likelihood of a confrontation with infinity every time the rocket took off, it was hardly likely to be. ‘50 per cent of the risk of a catastrophic failure during a long-duration space mission occurs in the first ten minutes after lift-off,’ he writes. Even if you aren’t interested in space travel – and in the beginning, I wasn’t – Chris Hadfield’s direct narrative style draws you in. And then you are given answers to those questions that free floated in your head about how astronauts use a toilet, how they sleep and a hundred and one other similar questions you never knew you had. 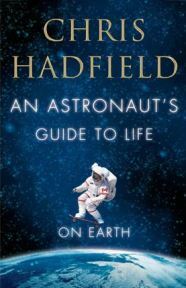 Hadfield draws on his 20 years of experience and draws the reader on a moonwalk along with him. Hadfield has already given his name to an airport, two Ontario public schools, and an asteroid but he wears his achievements with remarkable humility. His greatest moment was when he sang David Bowie’s Space Oddity with his guitar in the shuttle totally unconfined by gravity and the moment was uploaded on YouTube. Currently after Neil Armstrong, he is the world’s most famous astronaut. The result is, no matter how uneven this book seems to be, with its strange combination of self-help and memories, it is undoubtedly important. Now it’s up to you to take what you want to out of it and leave the rest. No Comments on "An Astronaut’s Guide to Life on Earth"